SAN FRANCISCO — The fifth annual CBA (Cherry Blossom Alumnae) Conference will be held on Sunday, Oct. 14, from 12 to 3 p.m. at the Japanese Cultural and Community Center of Northern California, 1840 Sutter St. in San Francisco’s Japantown. 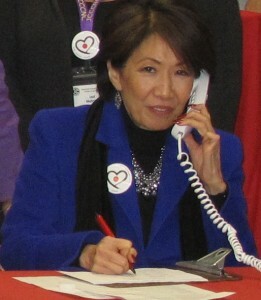 Jan Yanehiro volunteered at a telethon for Japan earthquake relief last year at the JCCCNC. This year’s theme is “What Every Asian American Woman Should Know.” The keynote speaker is Emmy winner Jan Yanehiro, who pioneered the magazine format on television, co-hosting the popular “Evening Magazine” for 15 years on KPIX (CBS5). She will be sharing key insights on what Asian American women should know today, given her successful career and personal triumphs throughout her life. The conference, which is open to the public, will feature a panel of successful Asian American women, including 2007 Cherry Blossom Queen Sawako Sonoyama, who will share insights on what they’ve learned in life. A bento lunch is also included. Registration is $20 until Sept. 30, $25 on or after Oct. 1. CBA members can sign up for $20 at any time. To register online, click here. CBA (http://cherryblossomalumnae.org) is a 501(c)3 nonprofit organization composed of former court members of the Northern California Cherry Blossom Queen Program. Its mission is to give back to the Japanese American community through volunteerism, education, cultural appreciation, leadership and financial support.